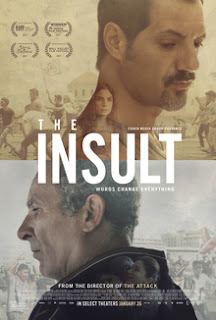 Watching The Insult is a bit like watching a disaster movie. As the chain of events falls into place we can see the disaster coming, the dread builds, and we careen towards conflict as an inevitability. That's the point of The Insult. It explores how our identities and our emotions push us towards violence and take us away from the things we truly hold dear. Tony is a Lebanese Christian who holds onto a large amount of rage related to atrocities which happened in his childhood. When he encounters a Palestinian Muslim, Yasser, this is unleashed, first in small but unproportional amounts, but then continuing to build. Yasser's own pride and history prevents him from being able to more effectively deal with his neighbour's rage. Together, the two are unable to keep what is essentially important to them as they head down a path of violence and retribution which ends up engulfing an entire city. The Insult is occasionally heavy handed. This isn't the most subtle allegory out there. The movie even ups the "drama" quotient by having each party represented in court by father daughter lawyers pitted against each other. However it is remarkably powerful in its message. There is a lovely little moment when Tony's impulse to fix a car (he is mechanic) overrules his anger at his "enemy." His humanity, what makes him a part of his community, triumphs, even just temporarily. The Insult works best when it is in these small moments between characters. Tony and his wife caring for their prematurely born child, the lawyers and their family dynamics, and Tony and Yasser together when they are forced to see each others' humanity. That is when The Insult is at its strongest.